The company behind the "Yes Scotland" campaign to win independence has been forced to make changes to its website, just days after being launched. The move came after complaints that people who followed its Twitter account were listed, along with their pictures, as supporters of the campaign. In future the website will only feature those who have actively signed up to the campaign. Campaign organisers denied social media followers were listed as "supporters". The website was launched, long with the cross-party "Yes" campaign last Friday, in which the SNP is playing a prominent role. 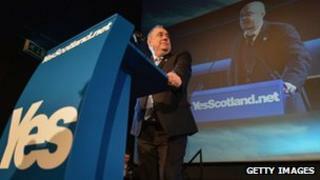 Scottish First Minister Alex Salmond has set a target for one million people to sign a declaration backing independence. Scots Labour MP Russell Brown said the change was a humiliating climb-down, adding: "For the last 24 hours, the nationalist campaign has insisted it did nothing wrong by harvesting people's names and photographs, pretending they were supporters." People interacting with the website using social media had been featured under the phrase, "Powered by people O' independent mind, like you." But this practice will now stop, following what a campaign source described as "feedback". Followers of the Yes Scotland Twitter account have begun appearing under the tag, "Already thousands have followed Yes Scotland, here are some of them . . ."
Yes Scotland Limited denied that those who simply followed the @yesscotland account on Twitter or liked the Yes Scotland Facebook page were ever specifically listed as "supporters", insisting this was only the case for those who logged in to the site and agreed to share their information.